Life in the sea isn't easy. Talk to most people about the ocean and they are likely to imagine a tropical scene with a stretch of golden sand and warm, clear water. The reality is often quite different – the marine environment can be a surprisingly cold place. Water conducts heat far more effectively than air, which means that submerged animals quickly lose their body heat. It's also harder to warm up again than on dry land, where animals often have the option of basking in the sun or on hot rocks. Finally, many aquatic animals use gills to get oxygen – great for breathing, but essentially another source of heat loss due to all the of water flowing across them and sucking away warmth. There are two main types of "thermal strategy". Some animals are not able to generate enough heat to warm their own body tissues, so their internal temperature is determined by conditions outside their bodies. These animals are known as "ectotherms", and typically include reptiles, amphibians, fish (including most sharks), and invertebrates. In comparison "endotherms", including humans, other mammals and birds, warm their body tissues by having high metabolisms to burn off food, which generates heat inside their bodies. These categories are similar to "cold blooded" and "warm blooded", but more scientifically accurate. An ectothermic lizard might be considered cold blooded on a cool evening, but (since their body temperature matches the environment) it rapidly becomes warm on a hot, sunny day. To avoid this kind of confusion, scientists prefer to refer to the thermal strategy, rather than actual blood temperature. 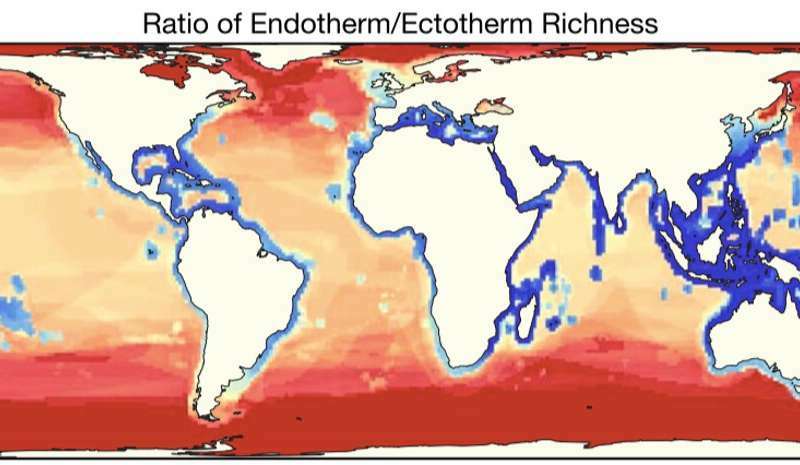 When marine species are separated into these categories of "ectotherm" and "endotherm", Grady and colleagues show a pattern of marine biodiversity that both supports and contradicts the previous theory. 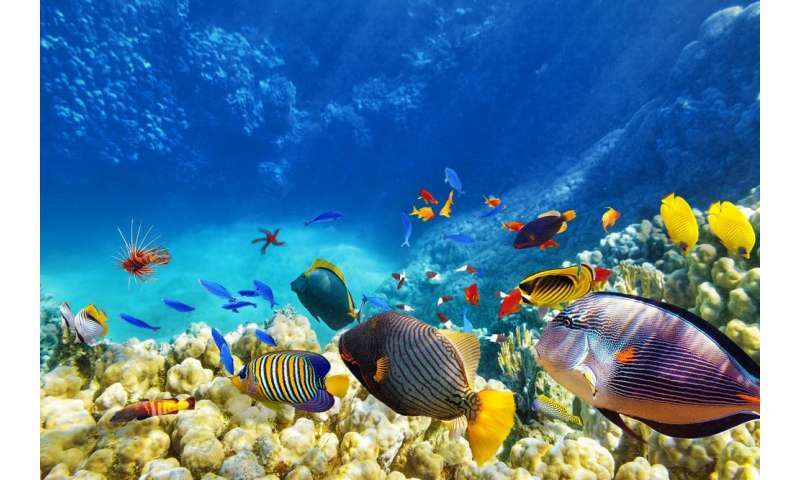 The reptiles, fish and invertebrates rely on their environment for heat, so follow the established prediction of being generally found in warmer climates with particularly high levels of species diversity in the tropics. Consequently, endotherms seem to buck the expected trend and instead show higher species richness in polar waters. 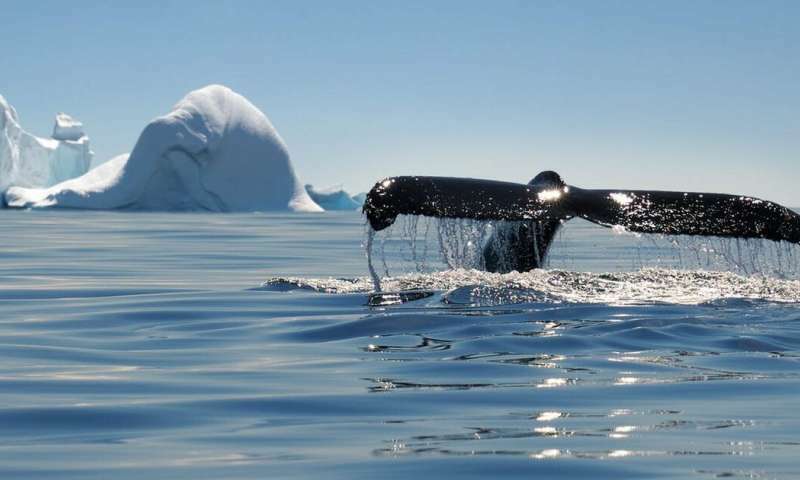 As the new study points out, seals and their relatives are "virtually absent from tropical waters" yet are common nearer the poles, while of all 89 species of cetacean (whales, dolphins and porpoises) only dolphins have "truly diversified in the warm tropics". This seems to make sense. But, of course, there is more to it than thermal strategy. Apart from a considerable difference in temperature, the tropics and poles also differ in other ways. For example, differences in levels of dissolved oxygen, nutrients, algae growth, light, and so on. As a result, some areas and species are the "exception to the rule". Regardless, categorisation by thermal strategy does show some interesting patterns of species diversity, and accounts for animals like whales and seals largely avoiding the warmest waters. But this advantage of environmental independence comes at a price. To maintain their heat-generating metabolism, endotherms have a continuous need for lots of high-quality food. 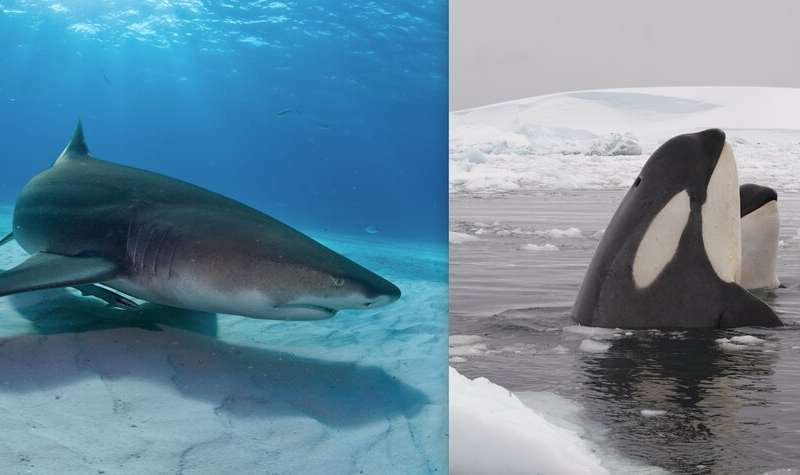 For instance an ectothermic lemon shark has to eat about 2% of its body weight each day, whereas an endothermic common dolphin might have to eat 12% or more. To be fair, there are a lot of factors to consider beyond thermal strategy, but that's still quite a difference.